Posted by dutchgrub	on Friday, January 2, 2009 at 00:04. 0 Comments. Ripasso is one of my favorite wines and I have been enjoying plenty of it recently in Amsterdam. Ripasso is an intense yet smooth red wine from Valpolicella, a well-known wine region in the Italian Veneto province. Valpolicella wines are made from Corvina, Molinara, and Rondinella grapes. In general, the wines are considered light and fruity. The exception is the precious Amarone – Italian for ‘the big bitter’ – an expensive wine classic. Amarone can be found on many a wine list and is known for its extreme, almost raisiny dryness and big, often daunting body. Grapes are dried for several weeks before pressing to make Amarone wines. The drying process causes them to lose over 50% of their water, resulting in wines that are intense and rich in tannins. Ripasso wines are made by an additional pressing – or re-passing – of fresh Valpolicella grapes over the pomace of dried grapes that were used to make Amarone. The re-passing causes an additional fermentation that gives Ripasso wines a lot more body and tannins than regular Valpolicellas without making them as dry or bitter as Amarone. If you’re like me and enjoy complex and flavorful wines that are not too dry, you will love Ripasso! A good Ripasso will have a deep ruby color and a nose of raspberry and cherry that is incredibly persistent. Ripasso wine is full bodied with a warm, balanced, almost velvety taste. It’s great with red meat, poultry, cheese and, if you ask me, almost anything else. Several shops in Amsterdam sell Ripasso and a number of restaurants have it on their wine list. 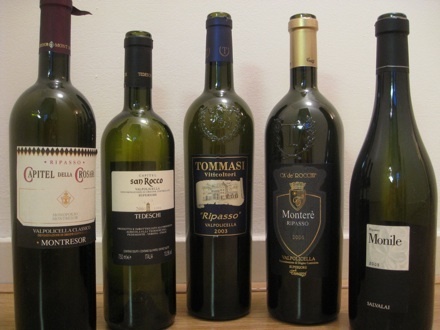 My recent Ripasso cravings were quenched by the Montresor Capitel della Crosara, Tedeschi Capitel San Rocco, Tommasi, Tinnazi Ca de Rocchi Monteré and Salvalai Monile. I found both the Tommasi and the Montresor at liquor store Ton Overmars on Hoofddorpplein. The Tommasi, the best of the selection in my opinion, goes for € 18. Well worth it for an incredibly smooth yet strong wine. And at € 9,- the Montresor is the best value Ripasso. Not quite as accomplished and balanced but still pleasant and harmonious. Ton also has a Tenuta Sant’ Antonio Ripasso Monti Garbi that he imports directly and sells for € 11. The Salvalai is on the wine list of Vooges one of my favorite eetcafes, which is located on Utrechtsestraat. And finally Frenzi Cucina has the Tedeschi Ripasso in both their restaurant on Zwanenburgwal and for sale in their shop on Overtoom. Filed under amsterdam, drinks, wine.